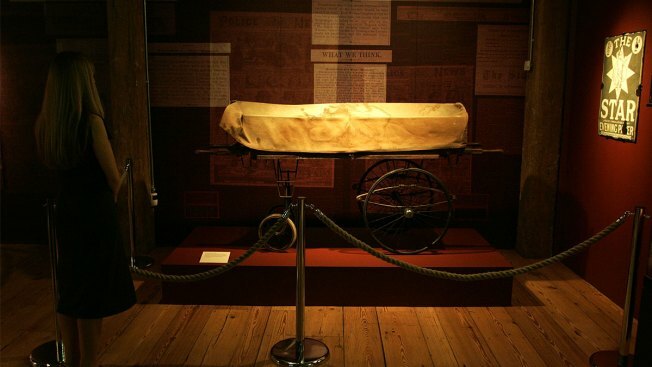 A member of staff looks at a mortuary trolley on display during a press preview for the exhibition "Jack the Ripper and the East End" at the Museum in Docklands, London, Wednesday, May 14, 2008. The identity of Jack the Ripper may finally be known, NBC News reported. A DNA forensic investigation published this month by two British researchers in the Journal of Forensic Science identifies Aaron Kosminski, a 23-year-old Polish barber and prime suspect at the time, as the likely killer. Jack the Ripper was the name given a notorious serial killer who terrorized England in the late 1800s.